With our reverse osmosis systems, you can experience water that never tasted so pure. It’s not only delicious, but it’s safe and soft, giving your family an improved hygienic experience. Using the state-of-the-art FILMTEC™ TFC membrane system, our filtration system gives you a more powerful filtration process compared to similar products sold elsewhere. The reason for this is the additional high quality filtration layers, allowing efficient separation of water molecules and impurities. The result? Clean and delicious water that’s safe to drink for you and your family. We stand by our products and are confident in saying that our system features quality engineering that delivers tasty potable water. The reason is the 5-stage reverse osmosis process. It removes contaminants that have damaging qualities, including the salt content that commonly makes soft water taste a little worse than what you’re used to. The process is relatively simple: water pressure pushes tap water through the membranes, which then act to remove impurities. Inorganic solids, in this case salts, are removed. The impurities never reach your glass and are flushed down the drain. We use your property’s own water pressure, thereby efficiently using energy. The quality of the membranes are key in this process, which is why we have chosen the best available on the market today. Reverse osmosis, or hyper-filtration, removes contaminants such as fluoride, radium, salts, turbidity, chlorine, and metals. You’ll get water that’s safe to consume and it’ll taste just as good as bottled water. This is because we use the same filtration systems that the big companies use! In other words, stop buying bottled water and use a reverse osmosis system instead. Our systems last for years. We fully back our product to last many years. Once we install our systems, we don’t expect to see you for a while! 50 gallons per day. Other systems work well, but they don’t provide enough water. With our 50 gallon capacity systems, you can be sure you’ll have plenty to use on a daily basis. Tasty water. Most people stick to bottled water because it tastes better. With our systems, we guarantee you can have the same taste from your own faucet. With our reverse osmosis systems, there’s no need to waste money and plastic buying bottled water! Safe for consumption. 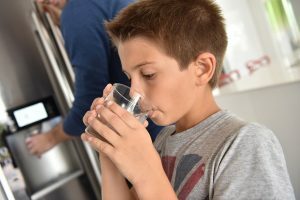 We have the professional expertise and the right products to ensure your family can enjoy water that’s not only delicious, but also 100% safe to consume. Whether you need it for your baby formula, your pets, or your own drinking water, it’s perfectly fine to consume. Interested in a reverse osmosis solution? We are happy to discuss your requirements based on budget, your property’s specifications, and wants. We’re not into pushing a sale, either; if you need advice or are just wondering how our systems work, please give us a call today.